අපිට මේ software එක උපයෝගී කරගෙන mp3 files වල tags edit කරන්න වගේම , ඒ edit කරපු files ටික පිළිවෙලකට අපි දීල තියෙන folder එකකට copy කරගන්න පුළුවන්. 1.මේ button එක click කරලා අපිට පුළුවන් database එකට mp3 files add කරගන්න. 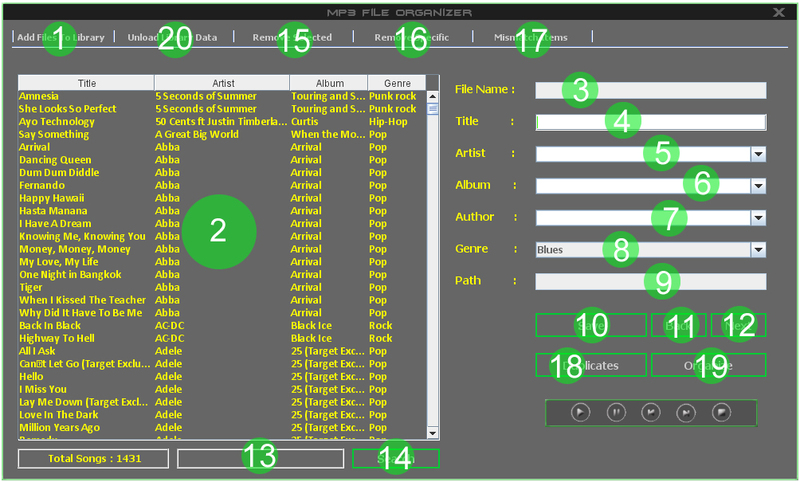 2.database එකට add කරගත්තා mp3 files ටික මේ list එකේ පෙන්නන්නවා. 3.list එකේ තියෙන record එකක් click කරහම ඒ file එකේ file name එක මේ field එකේ පෙන්නනවා. 4.select කරපු mp3 file එකේ title එක මේ field එකේ පෙන්නනවා වගේම අපිට මේ field එක update කිරීම මගින් title එක edit කරන්න පුළුවන්. 5.select කරපු mp3 file එකේ artistව මේ field එකේ පෙන්නනවා වගේම අපිට මේ field එක update කිරීම මගින් artistව edit කරන්න පුළුවන්. 6.select කරපු mp3 file එක අයිති වෙන album එක මේ field එකේ පෙන්නනවා වගේම අපිට මේ field එක update කිරීම මගින් album එක edit කරන්න පුළුවන්. 7.select කරපු mp3 file එකේ authorව මේ field එකේ පෙන්නනවා වගේම අපිට මේ field එක update කිරීම මගින් authorව edit කරන්න පුළුවන්. 8.select කරපු mp3 file එකේ genre එක මේ field එකේ පෙන්නනවා වගේම අපිට මේ field එක update කිරීම මගින් genre එක edit කරන්න පුළුවන්. 9.select කරපු mp3 file එකේ path එක මේ field එකේ පෙන්නනවා. 10.මෙම button එක click කිරීම මගින් update කරපු fields වල data select කරපු record එකට update කරන එකයි. 11.මෙම button click කරහම list එකේ තියෙන කලින් record එක select වෙනවා. 12.මෙම button click කරහම list එකේ තියෙන ඊලග record එක select වෙනවා. 13.මේක search bar එකක්,අපි මෙතන type කරන phrase එක තියෙන record ඔක්කොම list එකේ(2) filter කරලා පෙන්නනවා. 14.එහෙම search bar එකේ search එක type කරලා මේ button එක click කරන්න. 15.මේ button එක click කරපුවහම list එකේ select වෙලා තියෙන record එක database එකෙන් remove වෙනවා. 16.මේ button එක click කරලා අපිට පුළුවන් අපි දීල තියෙන condition එකට අදාළ වෙන records ඔක්කොම database එකෙන් remove කරන්න.මේ button එක click කරපුවහම තව window එකක් open වෙනවා. 1.අපි condition එකක් දීල එකට අයිති වෙන ඔක්කොම records ටික database එකෙන් remove කරන්න අවශ්‍යනම් මෙම option එක select කරන්න. 2.condition එක අදාල වෙන item එක මෙතනින් select කරන්න. 3.මෙතනින් select කරන්න සමාන / ඇතුලත් / අසමාන විය යුතුද කියන එක. 4.condition එකට අදාල වෙන value එක මෙතන type කරන්න. 5.file name එක සහ title එක අසමාන වෙන records ඔක්කොම remove කිරීමට අවශ්‍ය නම් මේ option එක select කරන්න. 6.මේ button එක click කරපුවහම අපි select කරලා තියෙන option එකට අදාළ වෙන record ඔක්කොම database එකෙන් remove වෙනවා. 17.මේ button එක click කරපුවහමfile name එක සහ title එක අසමාන වෙන records ඔක්කොම list එකේ filter කරලා පෙන්නනවා. 18.මේ button එක click කරහම , title එක සමාන වෙන records ඔක්කොම list එකේ filter කරලා පෙන්නන්නවා. 19.මේ button එක click කරහම , අපි settings වල දීල තියෙන විදිහට ඔක්කොම files ටික rename කරලා , අපි දීල තියෙන folder එකට පිළිවෙලට copy කරනවා. ඒ වගේම තමයි list එකේ තියෙන එක record එකක් හරි incomplete නම් (fields වල values empty හරි null හරිනම්) organizing process එක start වෙන්නේ නැහැ. 20.මේ button එක click කරහම database එකේ තියෙන ඔක්කොම records ටික remove වෙනවා. ඒ වගේම තමයිwindow එකේ පහලින් තියෙන mini player එකෙන් පුළුවන් select කරලා තියෙන file එක play කරලා බලන්න. අපි ඊලග පොස්ට් එකෙන් බලමු automation device controller application එක ගැන.